The fractious and temperamental Tualing clan have inhabited the uplands of Sudstrond for centuries, with a reputation as troublemakers. Tualing legend holds that long before the Bjornings blighted the shores of the Middarmark, when Græling kings and queens ruled across the land, Tua the Unruly was outlawed and cast out of her clan to prevent a blood feud after she slew her husband’s uncle. She and her closest kin made their way north to the lands west of the Gull Pass, where they established a steading, Tuasgard. Over the centuries, Tua’s clan expanded to encompass four more steadings, making them one of the most influential local powers. The Ageirings say that many years ago, Stigand’s ancestor, Val the Bold, purchased the Tualing steading of Bikkasgard to establish the fort of Valborg at the mouth of the Gull Pass. The Tualings, on the other hand, maintain they were cheated, forced to give up the steading at spearpoint by Jarl Val’s huskarls. Whatever the truth, the Tualings have regarded the Ageirings with suspicion and hate for long years. Following the Battle of Sølvfjord, a handful of hot-headed Tualing youths killed Valborg’s steward and occupied the fort, until Stigand’s huskarls returned with the jarl some years later, slaying some and driving out the rest. Furious, the jarl declared the clan outlaw. The Tualings’ neighbors, sensing an opportunity to seize valuable fields and pastures at the expense of their querulous Græling cousins, burned the Tualing steading of Larasstad, slaying most of the people and claiming their lands. It is now a haunted place. The Tualings retreated to their remaining steadings and declared a blood feud against the Ageirings and their supporters, which they have waged ceaselessly and ruthlessly in the decade since. It should be noted that as Grælings, the Tualings all have Feuding nature. Having formally declared a blood feud against the Ageirings, they have become terrible foes, as any actions taken in furtherance of the feud falls within their nature. Tua is a canny spirit, but prone to eruptions of temper whenever she believes that she or her descendents have been slighted. She bestows her favor on descendents who are proud, devious and unstinting in support of their kin. She is determined to destroy the Ageirings. The Tualing clan regalia includes Tua’s beaten bronze brooches strung with glass beads, a set of pitted iron shears, Tua’s loom, a fine steel battle axe, and an ancient ard plough. Most of the regalia is generally kept at Tua’s shrine at Tuasgard, but the ard is brought to the other Tualing steadings of Finnaby and Abbranvad for the plough rites. Player characters can be born into the Tualings or join the clan through marriage. Any member of the Tualing clan may use a piece of regalia in a ritual (Ritualist, Ob 3) to connect with Tua. When so connected, Tua can speak through that character’s mouth in furtherance of her belief or instinct. Likewise, she can provide help to characters that have performed the ritual, so long as they remain in contact with the regalia. She can only help within the context of her nature descriptors and if her belief or instinct apply. 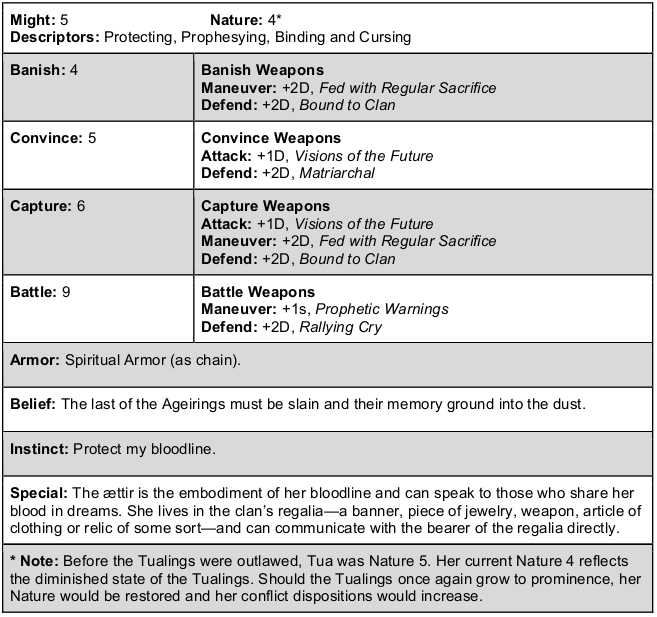 With her nature reduced to 4 due to the burning of Larasstad, Tua is somewhat weakened, but her clan retains three steadings and remains numerous. Like Tua, her descendents tend to be devious but tempestuous, prone to act impulsively and aggressively if angered. They are tight-knit and will stand against anyone and everyone in support of each other. Like Ran, Tua has an agenda. She wants Stigand slain, Ran’s shrine burned and her regalia destroyed. She wants to reclaim Valborg for her clan. And then she wants to make the Græling clans that burned Larasstad pay. But vengeance upon the Ageirings comes first. This entry was posted in Middarmark, Monsters and tagged Spirits, Tualings, Tualingsaga by Thor Olavsrud. Bookmark the permalink. I dig this, particularly the ard plough as part of the clan regalia. It’s easy to go high-level with regalia I think, but something more mundane like this is a great touch, particularly when combined with the plough rites. It’s also good to be reminded how dangerous the Grælings can be in regards to their Feuding nature, as that can have a lot of breadth. I think framing it around the ættir like this is a great way to both tighten it up in play and give more oomf to a campaign. Thanks Art! I agree. There’s definitely room for valuable regalia, but I think a lot of regalia is precious because of the meaning it has to the clan. I like to think in terms of practical heirlooms, like that cast iron skillet that gets passed down through the generations. And yeah, the Græling nature descriptors are often underrated, I think: Suing for seeking justice through the law and Feuding for seeking extra-judicial justice. Boasting and Demanding make Bjornings and Gotts powerful individually in the social sphere, whereas Grælings are dangerous collectively (as clans) in the physical and legal spheres.